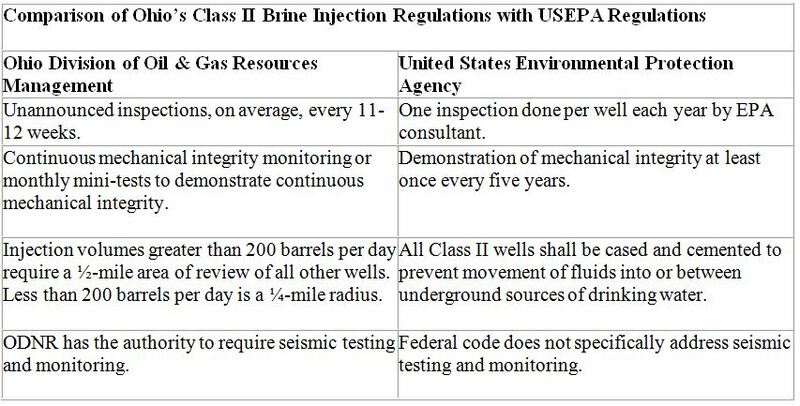 Last week, the U.S. Environmental Protection Agency (EPA) released a report that provides recommendations on minimizing seismic activity from Class II injection wells, specifically those used for underground wastewater disposal. Importantly, the report stressed that many states are addressing this concern proactively with their own regulations. Additionally, it’s worth emphasizing – as numerous scientists have concluded – that the vast majority of wastewater injection operations are not linked to seismicity, which the EPA also observed. The EPA report goes on to explain that it is “not a guidance document and does not provide specific procedures, but it does provide the UIC Director with considerations for addressing induced seismicity on a site-specific basis, using Director discretionary authority.” That’s an important clarification, because states are already well ahead of EPA in establishing regulations that mitigate the risk of seismic activity. With that said, let’s have a look at what some of the states are doing. In 2013, as part of this regulatory program, ODNR greatly expanded its seismic monitoring capabilities. In several cases, private well operators actually installed monitoring equipment at their own cost and shared the data in real-time with ODNR. This effort nearly doubled the number of seismic monitors operating in Ohio, detecting all types of seismic activity, including natural, non-felt events. In September 2014, a 2.1 magnitude earthquake was detected at the American Water Management Services (AWMS) injection well. Due to the seismic monitoring that was put in place by ODNR, regulators were alerted to the problem and a closure order was issued out of an abundance of caution. Reports found that the public wasn’t even aware of the earthquake. In September of 2014, the OCC increased its monitoring and inspections of disposal wells in areas prone to seismic activity. This year, Oklahoma strengthened its oversight by adding more to its list of earthquake areas of interest. To provide one example of how Colorado’s system works: In June, 2014, after COGCC determined that two seismic events could have been linked to an injection well in Greeley, regulators immediately shut down the well to assess the situation. The agency allowed it to begin operating again one month later under the condition that the company would continue at lower pressure and volumes and that it would plug 400 feet of the well to ensure the water didn’t flow into a fault. The operator was also required to install a seismic monitor, which COGCC could review, and maintained that it would shut down the well again if problems persisted. The bottom line is that the regulatory actions taken by the states are far more advanced than what EPA would require. Further, as we’ve seen from these examples, since states like Ohio, Oklahoma, Texas, California and Colorado have the flexibility to implement their own programs, they can easily update and strengthen their regulations whenever improvements are needed, without having to navigate a lengthy federal bureaucracy. In short: EPA’s latest report confirms that seismic risk associated with underground wastewater disposal remains low, and that state actions remain on the forefront of addressing and reducing that risk.